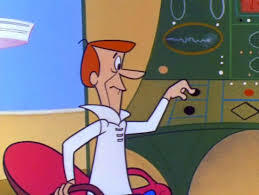 I remember The Jetsons the first time round, i.e. 1962 – 1963. They weren’t my favourite of the Hanna-Barbera cartoons. That honour would have to go to The Flintstones followed closely by Yogi Bear although I’d watch anything and everything there being only two channels. The two channel thing could be a problem because you had to choose: ITV or BBC. The only major conflict I can recall came in 1968 with the arrival of Magpie, a slightly racier version of Blue Peter: Sue Stranks didn’t wear a bra; you’d never catch Valerie Singleton sans foundationwear. I work on four different machines during the day and each has a different pointing device: the PC has a mouse; the laptop in the office, a trackball; the laptop in the living room, a trackball with a scrolling wheel (could never get the hang of the touchpad) and the tablet has a stylus so I’m always switching back and forth and yet my hand still hurts. Strangely it’s the stylus that causes me the most discomfort and it’s my ring ringer that’s the sorest because of the way I let the stylus rest across the nail. I had the same problem when I was at school and the nail on that finger ended up with a literal dent in it because of the odd way I held my pencil. I don’t remember anyone teaching me to hold a pencil; I was just given one, left to work it out and that’s the solution I came up with. We don’t have Sky but I don’t suppose our remote differs much from yours. I hardly know what any of the buttons do and I couldn’t care less. I also record everything. The only live TV we ever watch any more consists of Doctor Who and Strictly Come Dancing and they’re also set to tape just in case which is just as well because our sound went wonky at the end of Doctor Who on Saturday and all we did was jump to the recorded version, rewind and replay. Easy peasy. So this is the future, eh? No flying cars, no tinfoil onesies. And we’re only just starting to talk about so-called “smart homes.” When I see programmes talking about fridges that do the ordering for you I can’t help thinking of those ads from the 1950s talking about the latest time-saving mod cons. Still no robot butlers and even the word “robot” has been downgraded. If I can’t have a conversation with my toaster it’s not a robot, period.